Do you want to migrate HDD installed Windows 10 to SSD? Learn how to clone HDD to SSD Windows 10 and boot from the SSD without reinstalling Windows 10/8/7. Why you want to clone HDD to SSD in Windows 10? Many Windows 10 users found that their computer runs slower and slower. The hard disk drive (HDD) still has enough space. Thus, if your are tired of waiting for your computer to boot up and the programs to load, you may need to replace HDD with SSD (solid state drive). SSD has better properties than HDD. When you change your hard drive to SSD, your computer and programs will run faster than before. How to clone HDD to SSD in Windows 10? However, migrate data from HDD to SSD isn’t a simple things. How to migrate Windows 10 to SSD without reinstalling Windows and applications becomes a hard question to all users. Fortunately, here provides you a powerful and reliable tool for you to migrate data from HDD to SSD and you can boot from the SSD after cloning without reinstalling Windows and applications. The software is AOMEI Backupper. With this tool, you can easily clone HDD to SSD, and manage your SSD before cloning so that it will get into the best status when the cloning task finished. AOMEI Backupper provides you the easiest way to clone HDD to SSD in Windows 10/8/7. Here are the detailed steps for you. Step1.Connect your SSD to your computer, make sure it has already be detected by your computer. Install and launch AOMEI Backupper Professional (you can also download AOMEI Backupper Standard in free). 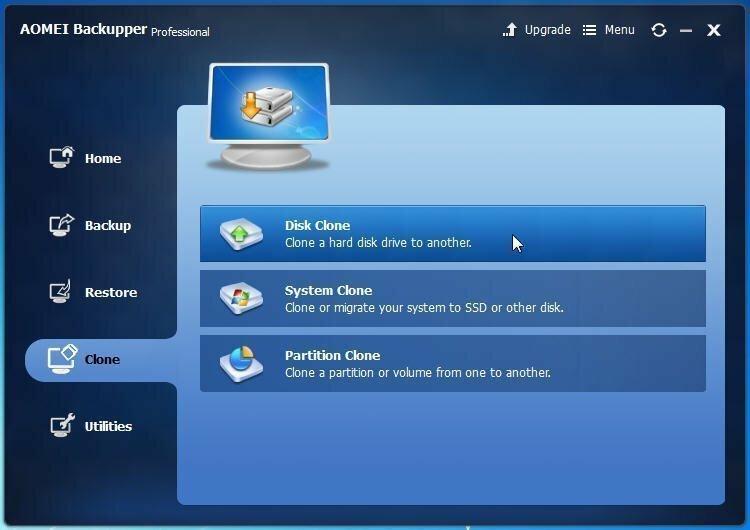 When you get into its intuitive interface, click Clone->Disk Clone. Step2. Then, select the old HDD as the source disk, click Next. Step3. Here you need to select the SSD you plugged before as the destination disk, click Next. Step4.Then, you will move to the final page, the Operation Summary where indicates the operations that will be executed. Click Start Clone to submit the whole task. 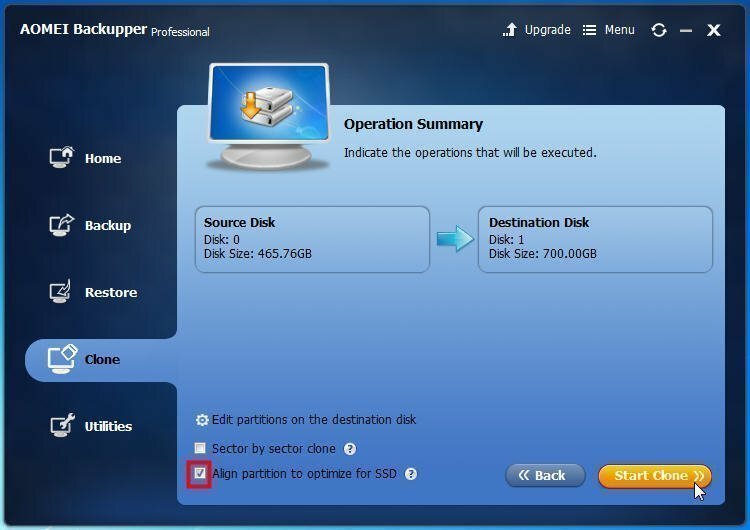 AOMEI Backupper allows you to edit partitions on the destination disk. You can edit it according to your requirements by opening the settings. AOMEI Backupper allows you to make an exactly clone for every byte by checking the box of “Sector by sector clone”. However, this feature do not allow you to clone hard drive to smaller SSD. AOMEI Backupper will optimize the performance of your SSD as only as you check the box of “Align partition to optimize for SSD”. It is highly recommended if your destination disk is SSD. After cloning, you can boot your computer from the cloned SSD by changing the boot order in BIOS. All data on the HDD would be migrated to the new SSD, and you do not reinstall Windows and applications. 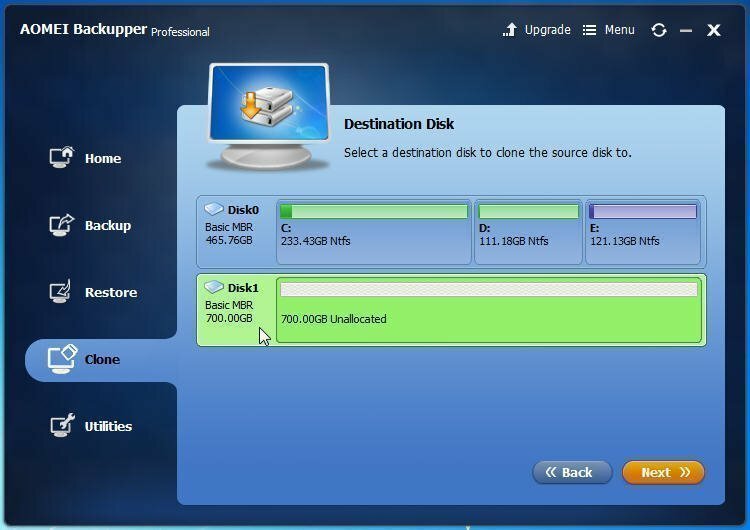 AOMEI Backupper is such a powerful software for upgrading hard drive. Besides, it is also a backup and restore software that you can use to backup system, create bootable media, make system repair disc, restore computer to earlier date, etc. What’s more, it has a special edition for Windows Server users, that is AOMEI Backupper Server. It can do so much for keep your Windows safe. In a word, it is worth for Windows users.